55 Gallon Drum OED synthetic 15W40 Diesel most economical has great fleet and operator pricing. Here is published synthetic diesel motor comparison oil test showing how well Amsoil Premium diesel synthetic 5W40 DEO and synthetic 15W40 DME performed with diesel in oil situation. If you cant see this click the thumbnail lower down on this page. It can expand quite a bit. 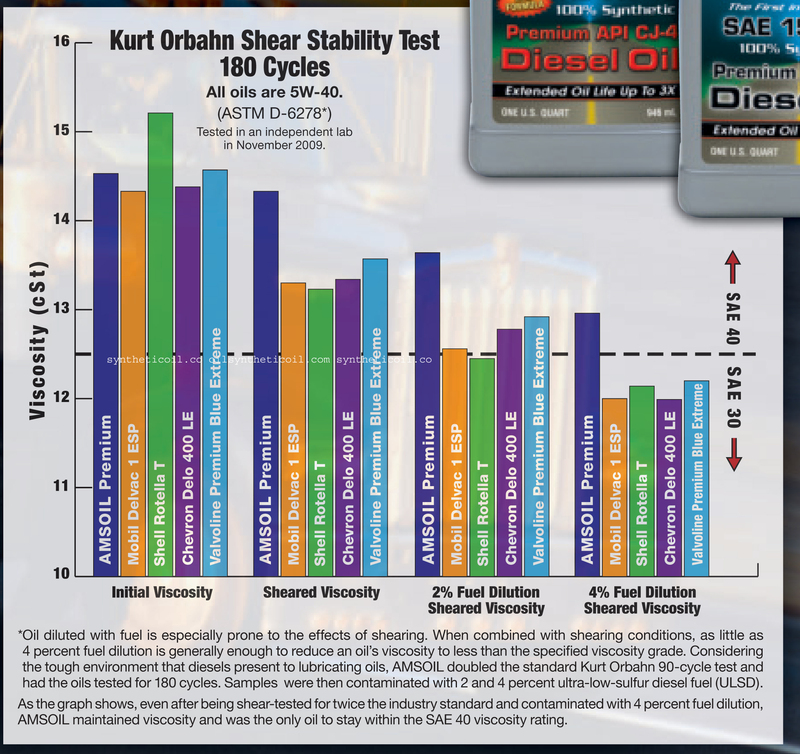 This diesel motor oil comparison is using the Kurt Orbahn Shear stability Test. The diesel motor oil comparison compares amsoil Amsoil DEO 5W40 Diesel oil and the Amsoil DME 15W40 diesel oil vs Mobil Delvac 1 ESP vs Shell Rotella T vs Chevron Delo 400 LE vs Valvoline Premium Blue Extreme. The diesel oil comparison test clearly shows that Mobil Delvac 1 ESP, Shell Rotella T, Chevron Delo 400 LE, Valvoline Premium Blue Extreme shear viscosity degrades quickly, The diesel oil comparison test further shows that at 2% diesel in oil shell rotella t falls out of grade, at 4% dilution Mobil Delvac 1 ESP, Shell Rotella T, Chevron Delo 400 LE, Valvoline Premium Blue Extreme fall out of grade. 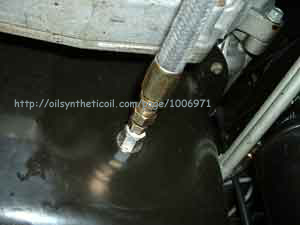 Diesel in oil is a big issue for 2007-2010 diesel pickups from Dodge, Gm and Ford. We have the solution, but first a quick explanation of how it gets there. Dodge, Gm and Ford have chosen to meet emissions by injecting raw diesel fuel on the exhaust stroke of combustion. This excess fuel can wash past the piston rings and into the crankcase. You can read more about this in the Technical Service Bulletin here. If you were not able to switch to synthetic diesel oil soon enough and you now are finding diesel in oil you do have another option. Some oils can tolerate up to 4% diesel in oil. Click the chart twice then you will see a published test showing how well Amsoil Premium diesel synthetic 5W40 DEO and synthetic 15W40 DME performed with diesel in oil situation.This diesel motor oil comparison is using the Kurt Orbahn Shear stability Test. The diesel motor oil comparison compares amsoil Amsoil DEO 5W40 Diesel oil and the Amsoil DME 15W40 diesel oil vs Mobil Delvac 1 ESP, Shell Rotella T, Chevron Delo 400 LE, Valvoline Premium Blue Extreme. The diesel oil comparison test clearly shows that Mobil Delvac 1 ESP, Shell Rotella T, Chevron Delo 400 LE, Valvoline Premium Blue Extreme shear viscosity degrades quickly, The diesel oil comparison test further shows that at 2% diesel in oil shell rotella t falls out of grade, at 4% dilution Mobil Delvac 1 ESP, Shell Rotella T, Chevron Delo 400 LE, Valvoline Premium Blue Extreme fall out of grade. Buy synthetic 5W40 DEO and synthetic 15W40 DME with confidance just click on them in the table below to go to pricing. Amsoil is about no compromises and saving you time. On our 6.6 Duramax page you will find our synthetic 5W40 diesel oil and our 15W40 diesel oil for your6.6 duramax. diesel oil for the 2007 and newer, and two weights for your 6.6 duramax diesel oil for 2006 and older. The correct diesel oil will enhance performance improve fuel mileage in your 6.6 duramax. In the table you will find a the best 6.6 duramax oil filter for your engine . You can click the number to read more or just order. Further in the table there is a listing for the best 6.6 duramax bypass filter . 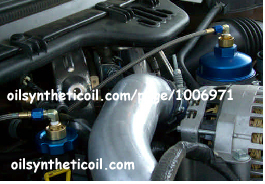 There is a 6.6 Duramax cold air induction system by injen to improve your power also.We have bulk oil pricing. For the best price for your order now please go here. The 6.6 Duramax works hard so it needs to be kept clean. We can go 2 micron clean and extended drain. To acomplish this we have the BMK21 and BMK27 bypass oil filter kit . bypass filter installation instructions for the best bypass filter for your 6.6 duramax, and we have pictures of actual installs.For more pictures of bypass filter intalls on 6.6 Duramax units please go to our installs table on the bypass filter page. To see an Injen install on a 6.6 Duramax please go here. To get your best prices today please go here. To look up 6.6 duramax synthetic gear oil, synthetic automatic transmission fluid, fuel filters, capacities, plugs, wires, wipers and finally torque specifications to button it all up when you are done. and torques specifications and recomendations for your 6.6 Duramax now click to link to the application guide Below I have built a basic table for quick order of oil and filters. If you have questions please call me (Santana ) call/txt 860 436 7034. If you know your product code ( the three letters )Click the price button next to it, then add to cart. Add prefered customer to cart and get instant savings of 25% -35%. All sizes are available quarts to 55 gallon drums, you can select the size once you go to the price page.. Local pickup is available at many US locations and several Canadian locations. You can call me for the location nearest to you. I would be glad to give you a quote over the phone or walk you through all the options. When you click I know that this is not a 6.6 duramax. I included this picture because it shows how an amsOil BMK21 bypass filter kit installed with the optional BK1202 oil return cap replacing the standard oil fill cap might look on a 6.6 duramax. Those anodized caps really dress up your 6.6 Duramax unit. The anodized cap is shown with the optional BP242 swivel fitting. 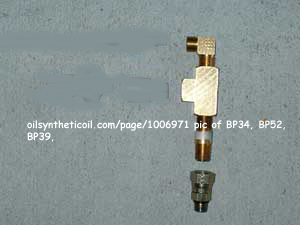 The contents of the BMK21 bypass oil kit are listed here. When you click this picture you will see a bypass filter kit hollow bolt installed in non 6.6 Duramax oil pan. It is the BP40 self tapping hollow bolt which which is item number 15 on the bmk21 PARTS list. To buy our DELUX bypass filter kit for the 6.6 Duramax order the BMK21, EaBP110, BK1201, BK1202, BP242(2). The preferred customer price for this kit shipped to ct. feb 20,2011 was about $ 326.00. Prices are subject to change without notice. To see complete installation instructions for the BMK21 bypass filter kit please go here. 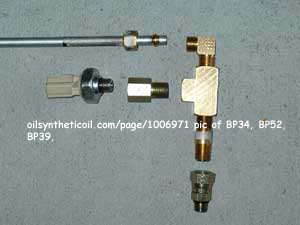 Here is a list of the parts contained in the BMK21 bypass filter kit. There are some optional items listed also: You would use the BMK 21 on a 6.6 duramax if you choose to mount the bypass filter somewhere in the engine compartment. The BMK 27 is usually mounted underneath on the frame. WE call this synthetic diesel oil DEO. DEO is a synthetic 5w40 specifically designed for 2007 and newer diesels. 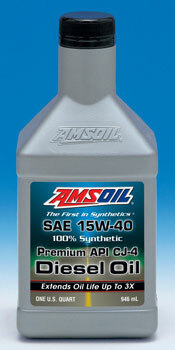 AMSOIL Synthetic 5W-40 Diesel Oil (DEO) is the premium choice for API CJ-4 emission-quality diesel oil required by model-year 2007 and newer diesel engines. It delivers extraordinary lubrication in diesel engines found in commercial, fleet and personal vehicles. Built with the latest additive and synthetic base oil technology, AMSOIL Premium Synthetic 5W-40 Diesel Oil exceeds the higher performance demands of modern engines. It withstands the stress of heat, soot and acids to help prevent deposits, wear and corrosion. AMSOIL Synthetic 5W-40 is wax-free with a broad viscosity range to provide exceptional cold-weather starting and high temperature protection. It resists breakdown and offers maximum fuel efficiency over extended drain intervals. DEO brochure here. WE call this synthetic diesel oil DME. DME is a synthetic 15w40 specifically designed for 2007 and newer diesels.AMSOIL Synthetic 15W-40 Diesel Oil (DME) is the premium choice for API CJ-4 emission-quality diesel oil required by model-year 2007 and newer diesel engines. It delivers extraordinary lubrication in diesel engines found in commercial, fleet and personal vehicles. Built with the latest additive and synthetic base oil technology, AMSOIL Premium Synthetic 15W-40 Diesel Oil exceeds the higher performance demands of modern engines. It withstands the stress of heat, soot and acids to help prevent deposits, corrosion and wear. AMSOIL, the leader in automotive synthetic lubrication, produced the worldâ€™s first API-qualified synthetic motor oil in 1972. Trust the extensive experience of AMSOIL, The First in Synthetics, to do the best job protecting your engine.DME brochure here. We call this AME. AME is a synthetic 15W40 for Pre 2007 Diesels. AME is recomended for diesel and gasolines engines and other applications requiring any of the listed worldwide specifications .AMSOIL Synthetic Heavy Duty Diesel & Marine Motor Oil (AME) is a premium diesel oil providing excellent performance in all types of diesel engines where highly effective control of wear and deposits is vital. Built with heavy-duty dispersant/detergent additives, its 12 TBN chemistry neutralizes acids and controls soot thickening from EGR and blow-by to protect against corrosion, cylinder bore polishing (wear) and varnish/sludge deposits. AMSOIL 15W-40 Diesel Oil resists heat and breakdown better than conventional petroleum oils for long lasting performance and protection.